Many businesses are (unfortunately still) unaware, that the Online consumer behavior heavily on the consumer behavior offline different. Content is the Web site content, So texts & Multimedia content. Content is a key consideration for the Success a Internet presence. Often the texts are very much neglected. Not only with information sites is the content one Competitive factor. Good product texts in online stores Konversionsrate increase. Good communication is vital to the targeted Sales approach. Therefore, the content must be for the Nutzungsgewohnheiten be adjusted on the Net. Offline, a Information Brochure Created. This information is not in accordance with the Content-Writing-Regeln worked up. On the contrary, The brochure will be made summarily scanned into the net. In most cases, which is positive to note, good interactive features built, for example. influenced by a "continue" a positive user experience. ignored here, however, were all Usability-Content-Writing- Regulate. Worse, even after use of Vergrößerungsfunktion It is not possible, to read the text. A Druckoption is helpful. Satisfied, but the need for information not immediately. On the contrary, makes it more (unnecessary) Action steps / actions in a Kaufentscheidungsprozess necessary. Purchasing decisions However, the customer should be made as easy as possible. Nor is it beneficial to link PDF files as text. Still ugly, if the Repeat content, analogous to a scientific book. "Selling with good lyrics more"
Here, in a case-study, the conversion rate improvements by the influence factor "Content" on product pages analyzed. It was found, that loveless created standard texts or even only 1:1 Copies of the supplies by the dealer, User delight scarcely. For search engine optimization are the only texts (with keywords) crucial. For online stores, as reported by the Internet Business Word, are even Produkttexte by Christopher Brenner (SEO Specialist), from Google view the most important content element of the product pages. He explained to the Ecommerce Conference: "Ultimately, it is important, zuhaben in the pages of good writing, a Google good ranking to get. " Companies must understand the needs of their target groups and the right Tonality meet. A change from the company perspective to Customer focus is essential. Usability Content Writing rules to follow, so that the user Confidence Find and convert into buyers. Content is so important that you observe as CRO instrument. It is important, amongst a number of usability criteria, Look there & Feel the Presentation. 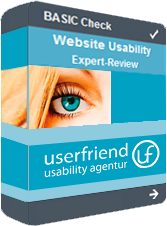 Let your next Content 6 further usability testing dimensions in a BASIC Check (Usability Report) analyze. For in concrete examples rewritten Text and explicitly Content Writing Regeln. Even a complete Revision the content can be connected to external service, zB. an userfriend.de be commissioned. The French translation is not understandable, damage, le contenu de la version allemande me suffit 😀 Vive le billinguisme franco-allemand!